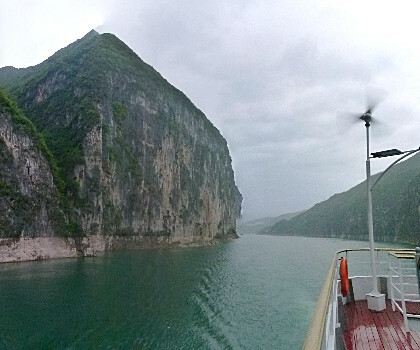 Down the bank of the Yangtze river to board our cruise. We had no idea which of the boats we would be boarding. It wasn't either of these. The pontoon bridges are required because of the fluctuations in the river level. Accommodations on our boat, the Yangtze Gold 8, were quite nice with a balcony where we could sit and watch the world go by. Initially the view was limited by another boat that was alongside also taking on passengers. The central lobby had an impressive chandelier. A map of our route. An easy trip, not likely to get lost, and it's downhill all the way. A look around the city as we were getting ready to depart. The clock tower, other cruise boats putting on a show, and folks who were rushing down the ramp to get aboard before we set sail. First time we have been on a boat flying this flag. Underway we saw quite a few ore/materials boats. A dredge being relocated by a tug. However, it is hard to get the clothes clean when this is what is in the river. A modern cable stayed bridge over the gorge and an arch bridge. These holes were where people mined for clay. A massive pagoda or temple on the bank. Sorry, I don't remember it's name. There were a couple of on board shops. Some of our group just couldn't pass up a bargain. We stopped to see the Red Pavilion. Parking again was at a premium so another boat was close. We walked through a street market on our way. As we enter the historic site. Figures from Chinese mythology flank the entrance. We crossed a suspension bridge to get to the island called Shibaozhai (traditional Chinese: 石寶寨; pinyin: sh� bǎo zh�i; literally: "Precious Stone Fortress") where the Red Pavilion stands. This temple is one of the first things you pass on the island. The entrance to the pavilion. At the top is a three-storied hall dedicated to Manjusri built during the reign of the Xianfeng Emperor (1850–1861), called the Purple Rain Pavilion. In the year 1819, the nine-story pavilion was constructed adjacent to the cliff to aid people in getting to the top of the hill. Prior to the construction of the pavilion, visitors to the temple were hoisted to the top using a system of chains. 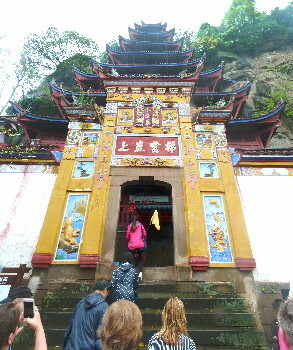 On the top of the pagoda is a Buddhist temple. 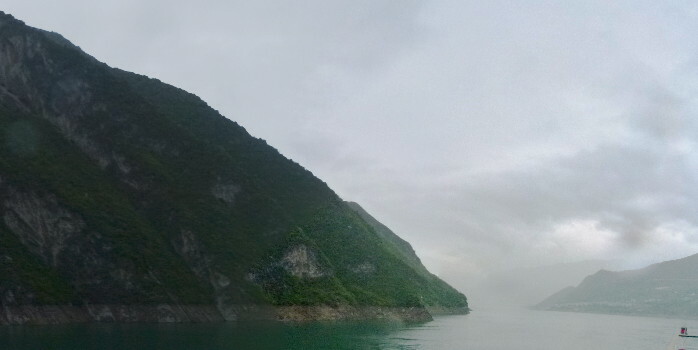 The construction of the Three Gorges dam would have flooded the lower levels so they built this little dam. The river is on the other side of this wall. One level up the pavilion you can look out at the back of the yellow entrance gate. Beyond it people are standing on the wall that holds back the river. Inside there was a memorial to General Ba Manzi who found himself dealing with a war with another kingdom and a rebellion at home. He enlisted the aid of Chu, an adjoining state, promising to give them three towns as payment when they won. However, when they prevailed Ba Manzi said he could not give up the towns and instead killed himself as payment. The King of Chu was so impressed with Ba Manzi's bravery and loyalty he accepted that payment. He then sent his head to the kingdom of Ba where it was buried with full military honors. A couple of levels further up was a statue of Buddha carved into the face of the rock. Ancient stone steps still open if you want to try. It goes from the 7th level to the top. Before they were built people climbed holding on to a cable and using holes carved into the rock for steps. Some of our group were still in the small courtyard waiting to climb the last last few levels. Our boat beyond the deer(?) decorating the pagoda. Some of the figures in the Kui star pavilion which was erected to honor the god of scholars. If you are a hard working student with excellent performance you will be selected by Kui Xing to be on the list of successful candidates. It also refers to the last star in the bowl of the big dipper constellation. There are three bridges in the Three Gorges region said to have access to earth, hell and this one to heaven. It is called the Aihe (loving care) bridge. It is also called the Tongtian (bridge with access to heaven) bridge. If you have done many good deeds and have a heart of care and you can cross the bridge with no more than 10 steps your best wishes will come true. The jade Emperor and the Queen of Heaven. He was the king of all gods, dragons, seas, and the kings of hell. He is said to visit the real world to see the good and evil of life on the 25th day of the 12th month. She is also known as Xi Wangmu and is of unsurpassed beauty, here dressed in royal style. The third picture is of some of the many goddesses who serve her. According to legend there was once a hole from which rice flowed. That day the rice stopped and has never come again. Looking down from the top we could see the bridge we crossed to get to the island and the nearby countryside. What remains of a canon which was part of the defense against foreigners. Our guide, Jeff, grew up not far from here so he wanted to show us some of the local foods. He took some of us to a small eating place where we had long noodles which he said led to long life. Some young ladies posed for pictures with us. One asked to touch my beard to the amusement of her friends. Both staff and guests tried to figure how a ring gets tied to a chain when it is dropped. This colorful "aurora" was a result of fog and the lights of our boat. Some of what we saw as we traveled. Many cliffs, a couple of towns, some fields, and a few single homes. 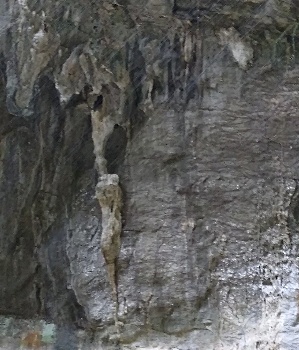 The caves were actually where the local people mined clay for construction and crafts. We stopped here to transfer to a smaller boat so that we could travel up a channel that was too small for the one we were in. Among these was our new craft. It was hard to imagine what these cliffs must have looked like before the dam was built. Back on the big boat we continued down stream past cliffs, orchards, waterfalls, and a ferry. And these structures which may have been used to load barges with ore or grain. Note the steps and ladders that let the one on the left be reached for maintenance. We got off our boat here to visit the dam. As we went through the town we crossed a tributary that lead to the river. Some pictures around the dam. The electrical substation for power generated by generators in the dam and above one of the locks. The view downstream from the dam. Inside the visitors center there was a large model of the dam and its surroundings so we could get a better idea of what we had seen. Just one picture to show a bit of dessert that night as we got into position to pass the dam. And another of one of the bouquets decorating the ship. Into the locks to continue downstream. Some boats could be put side by side. Ours was too wide so we were by ourselves. One afternoon passenger teams competed in some fun games. or shake ping pong balls out of a box tied to your backside. Here is our team at dinner. Amateur hour provided another chance for the passengers to entertain each other with skits, songs, and magic during our last night aboard..
One last view of our boat as we disembark.